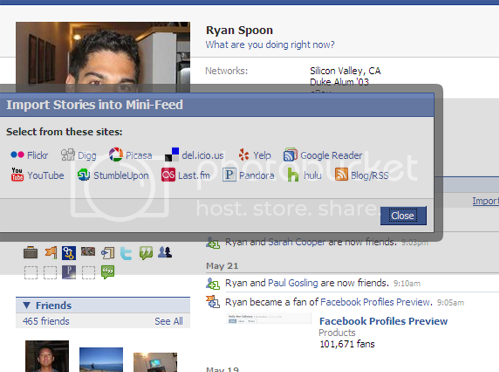 Should Facebook Acquire FriendFeed, Twitter and/or Digg? I’ve thought a lot about this as Twitter and FriendFeed continue to grow and as Facebook has begun to experience declining traffic. My personal feeling is that, as products and consumer services, Twitter nor FriendFeed should really exist on their own; rather, they are products (pun intended) of Facebook’s oversight. Think about it – Twitter and FriendFeed are more powerful, distributed versions of the social feed. And as Facebook’s traffic begins to decline, it’s increasingly obvious that they are taking note of this new generation of social interaction. Just yesterday, Facebook expanded their Feed product (making an obvious push into FriendFeed’s territory) and they are including more and more native profile enhancements (seemingly) modeled after utilities and applications built by 3rd parties and proven successful by the community. What will become interesting is whether Facebook is able to push either Twitter or FriendFeed aside (or the next upcomer) … and with their massive user-base, that is a real possibility. Or, will Facebook become a web 2.0 acquirer (like Yahoo, Google and eBay)? Acquired web 2.0 sites like Delicious, StumbleUpon, and Flickr - and potential targets like Digg, Twitter and FriendFeed – might make a lot of sense to Facebook (and help invigorate their site usage).